When I was first driving, my key chains out-numbered the passengers I was allowed to have in the car. They were big, clunky and heavy but so very cool. 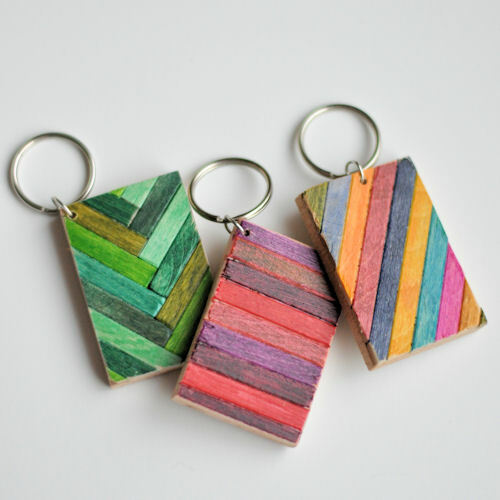 : ) Nowadays, I think of my keychain as a piece of jewelry — I crave something with color and design, something that feels good in my hand — and these wooden key chains fit the bill. I think they would make such a pretty “just because” gift for a friend, and they would be perfect to celebrate someone’s new driver’s license as well! This project isn’t as detailed as you might think. Using markers instead of paint, there is less fiddling and dry-time is non-existent. Then with a little patience and strength, an ordinary blade can cut through the wood. Simple materials, simple tools, simple project. 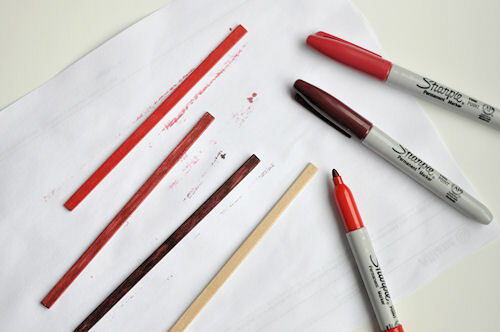 Color the wooden sticks in your desired shade(s). Cut the sticks down to get the most coverage out of each stick. 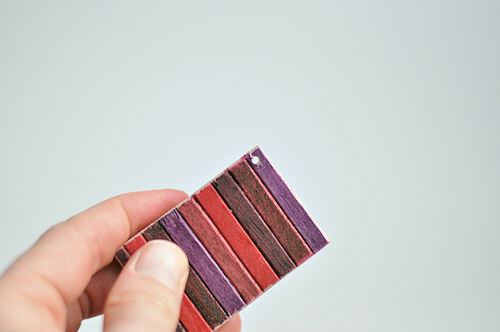 Cover the pendent with a layer of glue and adhere the colored sticks. Allow to fully dry. Using the very sharp cutting blade, trim off the excess wooden sticks. This takes a number of swipes with the blade. Just be patient, push hard and soon enough, the edges will be cleaned up. Use the sand paper to smooth the edges. Use the drill bit to make a hole for the jump ring. Before I attached the jump ring, I topped the key chain with Modge Podge. Attach the jump ring and, if necessary, attach to the key ring. 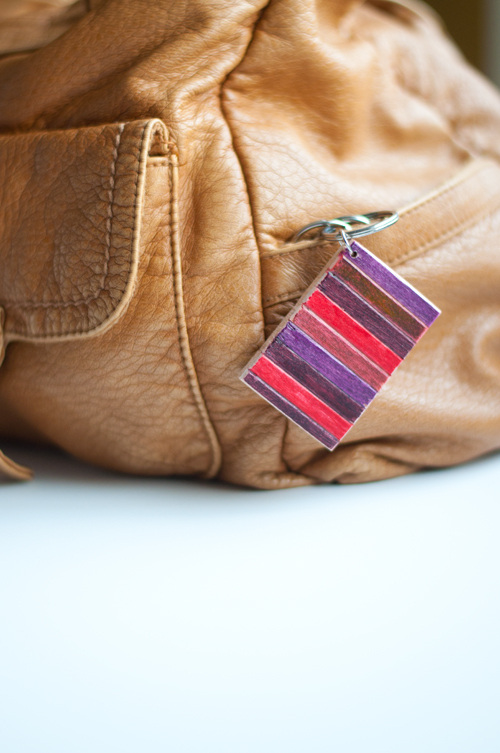 Attach to keys or a backpack zipper and enjoy the pop of color and design. – A craft activity at a tween or teen birthday party. 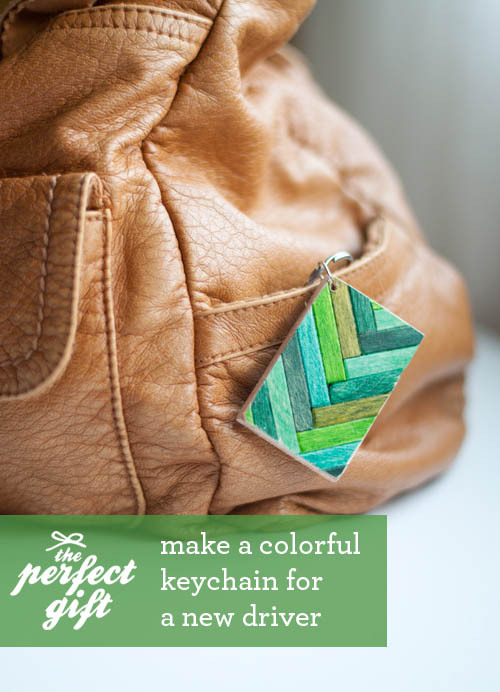 – Using as statement necklace instead of a keychain. I *adore* the chevron one at the top of the page. I just pinned it so I will remember to give it a go! I love this idea. I was just thinking the other day how I don’t have any cool key chains anymore (as an adult/mom). Although, I do think I would just prefer to buy one on Etsy or something (or have someone gift me this)because I am not good with any sort of blade or drill at ALL. Thanks for the fun idea though! What a great project! Terribly easy and cute. Love the pen ‘painting’ idea. That’s really cute. I love the design, and how easy it is to make! 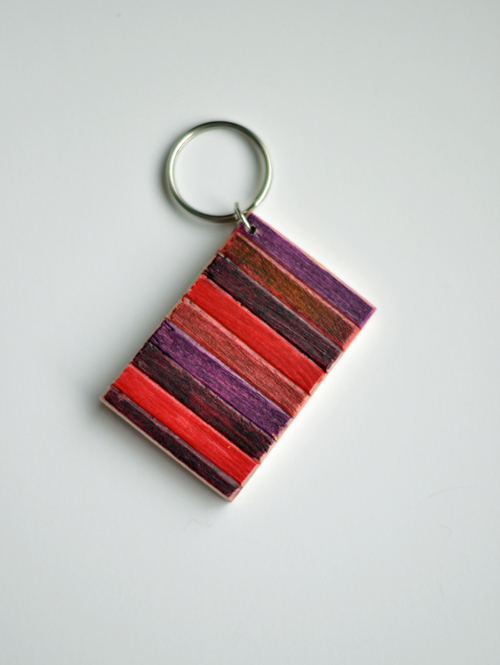 We are manufacturer of various type of wooden items such as wooden key rings, wooden coasters, wooden lifestyle products etc. If you have any requirement then kindly contact us or give us a chance . I adore this and am so happy I found you! 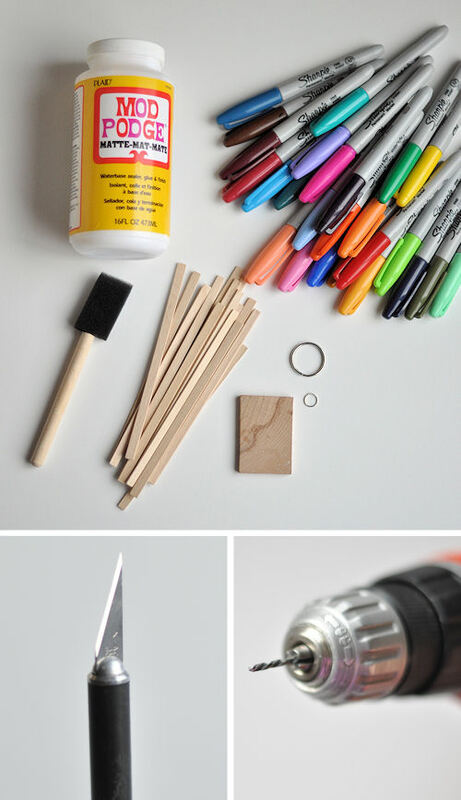 I am going to give this project a go for my 4-H kids. Thank you! 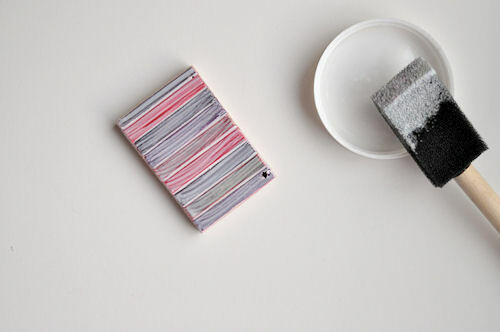 I’m very much interested in making these. So far though the only items I can’t seem to locate are the wooden strips. What kind did you use specifically? 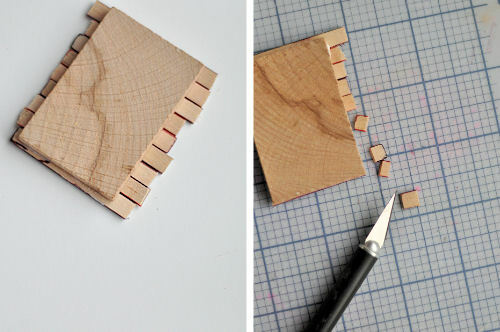 I’ve found some that look similar but they’re balsa and basswood strips and very expensive for a bag of them. Can you list maybe where to find the items online or the stores you found them at? That would be very helpful. Thank you! Ashley I was thinking about doing some of these. 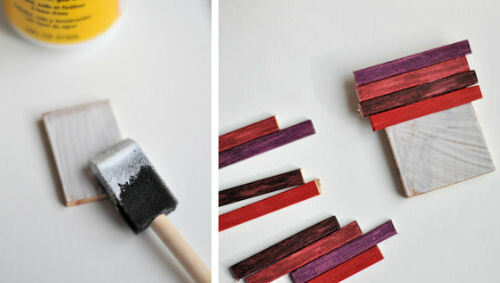 You could probably use craft popsicle sticks. If you want to experiment on different widths you can use the razor knife and a metal ruler to cut them to different widths. Dollar tree even sell a package of sticks that are already dyed different colors. Just the thing for my husband who is always asking me where his keys are!